DIY Glowy Galaxy Mobile #ArtTuesday « Adafruit Industries – Makers, hackers, artists, designers and engineers! I have seen a lot of 2D galaxy art on the internet, such as galaxy shoes, t-shirts, wallpaper, etc but I haven’t seen any 3d renderings. 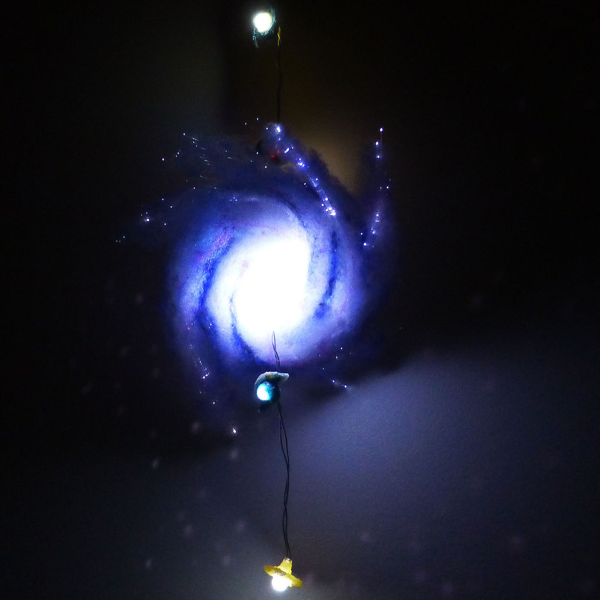 In this Instructable I have attempted to make a 3D galaxy in the form of a hanging mobile. Since I haven’t figured out how to create a black hole (yet), I resorted to using Christmas lights, fibre optic filaments and some polyester batting. The mobile has one large galaxy, which sort of looks like the Milky Way and four smaller more distant galaxies.